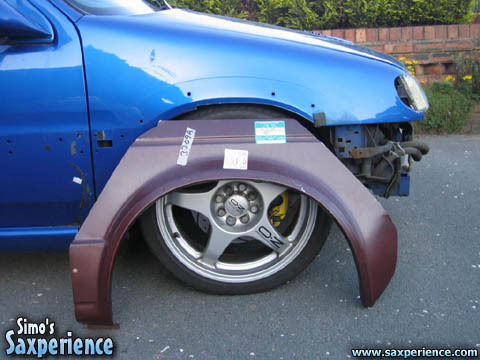 The arches I had decided to use were from a VW Golf... 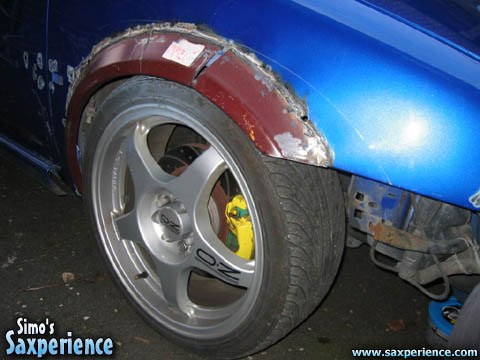 Myself and DannySp8 were going to do all of the body work, so it was going to be quite an achievement! After chopping one of the steel arches up to trial-fit we knew it was going to be an interesting project. The VW arch actually fitted the curves of the standard arch quite well! Now committed to completing the new mod's, I started to strip the car of all of the standard bodystyling trim and removed the front and rear bumpers too. 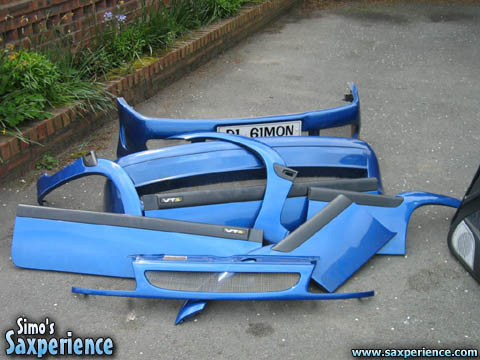 I was left with a huge mound of Poseidon Blue Saxo parts... I must have been mad! Myself and Danny trimmed all of the steel arches upto the correct pattern, then I took the car to Duncan Forrest of Goldrig Fabrications. Duncan had the task of trying to seam weld all of the arches in position, which wasn't as easy as it may sound, as both the standard arches and the new arches are made from very thin steel! One automotive specialist had already refused to do the job, saying it couldn't be done... but Duncan really likes a challenge! My car needed to be at the FCS 2004 event on the 30th May, so there were huge time pressures to get everything achieved in time! 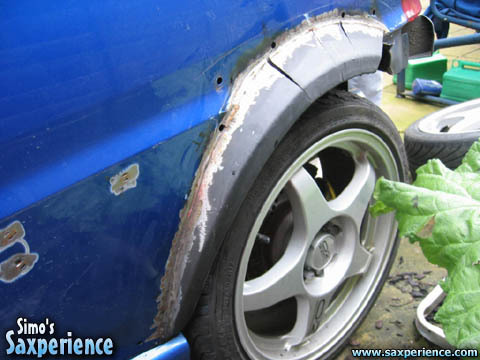 Duncan came up with the goods and did a great welding job on the arches and gave my car back the very same day! Very much appreciated - Thanks Dunc'!